Someone mentioned to me a few weeks back that they felt for me in order to ring fruition to the ideals and dreams I had for myself I may have to see them on paper… unaware of how the heck I would be able to put a dream on paper, I asked them to clarify. 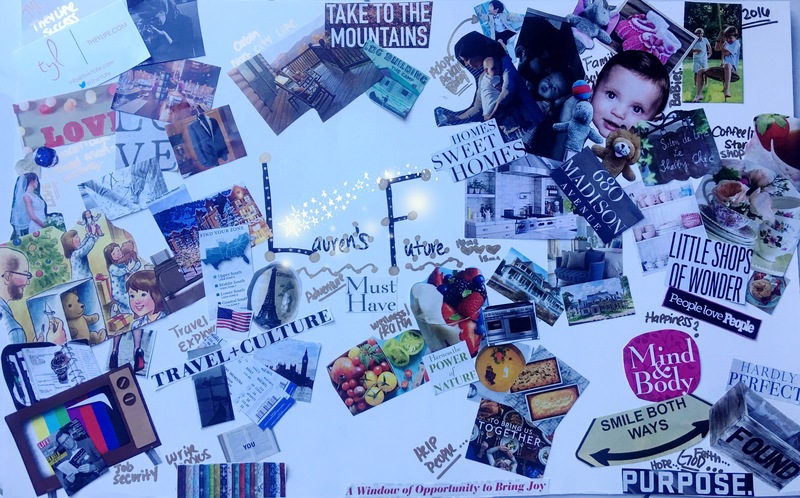 A Vision Board, I had always seen those in movies and television, but I had never actually taken the time to make one for myself. Intrigued by the idea I ran to the craft store and picked up some essentials.. I started off by actually penning with a marker onto the Poster Board every word for what I knew I wanted for my future. Then, I went browsing and carousing through dozens of old magazines I had laying around the house and even some that I had purchased just for the board. I went a little nuts just cutting out all sorts of different images and phrases, I believed went along with the motto I had envisioned for my future. Little did I know each image would actually fit perfectly into one of the categories I had already written onto the board… so as I went on pasting each and every image to a pertaining category I thought was suited for it, I could instantly feel how this mission was already helping clear my thoughts towards a clearer future. Sometimes in life we hit roadblocks, some of these blocks are so powerful they stop us right in our tracks and if we don’t have a good support system around us we can lose touch with who we are and who we are meant to become and fall down the wrong tunnel along the path. Luckily for myself, along my path I have had such wonderful people always willing to inspire me and help me understand my purpose… Y do we question our lives? I have come to the conclusion that as young adults we set aside this ethereal ideal for the life we want to have, it has dustings of magic from our un-jaded hearts sprinkled throughout, and yet as we mature and our path is reformatted by the opportunities presented along the road, which were probably not the ones you had envisioned for yourself… Dreams are recalculated and change their meaning, they may never leave us, but sometimes we have to readapt them to the truth that now exists. The old Yiddish proverb says ‘We plan, God laughs’ … Life is a journey which sometimes takes unexpected turns and we end up arriving at destinations which weren’t quite expected or in the ‘plan’. Sometimes we just have to resort to living with the punches and this is precisely why Vision Boards are so helpful… You see, you aren’t defining what your life will be or will become, you are just slating out potential images, you want to see somehow and someway inspiring your life and becoming a part of your future. If you think you have everything plotted out in perfect form. don’t hold on too tight, life has a way of shaking things up on you… so mark your visions and know that anything in between will probably be a blessing in disguise.